One doesnt go to action movies for airtight logic and solid reasoning, and Antoine Fuquas Shooter is no exception to the rule. Still, if you look past the ridiculousness of its mainline plotting you might find an interesting example of Iraq war fatigue lying underneath. 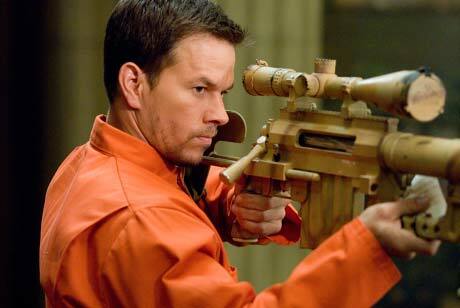 Mark Wahlberg plays a man named Bob Lee Swagger (honest to God), an expert sniper who was left behind to die after a botched mission in Ethiopia. Some years later, hes approached by a bunch of dodgy government types led by Danny Glover; it seems they want him to avert the assassination of the President, only they actually take the shot and pin the blame on Swagger. This leads to a massive chase across the U.S. as our man tries to track down the guilty parties and clear his name. Much of the film is ludicrous on the surface, with Wahlberg/Swagger doing various MacGyver-ish things while Kate Mara stands around in tight, revealing tops. But theres a core of genuine anger that keeps the film from falling apart, taking the cruel disappointments of the post-9/11 era and turning them into a hyperbolic fantasy thats surprisingly satisfying. Not only is Wahlberg perfectly cast as the square-jawed, slow-burning hero but Fuqua turns in one of the cleanest and most subdued films hes ever done, somehow managing to lend credibility to the parade of absurdities and gratuitous cheesecake. Furthermore, the film commits totally to the cynical atmosphere surrounding Bush IIs reign, which is not the sort of thing you expect from this kind of genre outing. Your life wont be changed by the experience but the genuine rage and frustration might make you like it more than the average actioner.